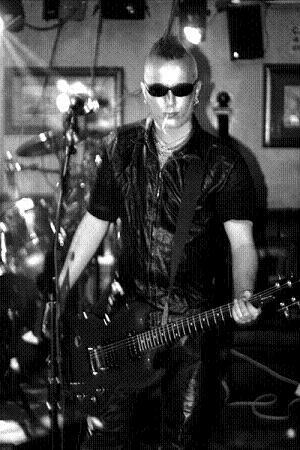 The Sisters of Mercy MARK2005 proundly feature Leeds music scene activist Chris May (aka RoboChrist, aka Chris Catalist) (pictured right) as the third secondary guitarist since the band was resurrected for live-gigs-only-life in 1996. Chris May replaced Chris Sheehan. First impressions of the new guy seems positive - he knows both how to properly abuse the guitar and how to liven up the stage with his presence. Shortly before joining Sisters Chris May has achieved minor fame as RoboChrist, a painted-face guy performing to backing tracks of dance beats spiced with various samples (which is all "very interesting", - or so Lord Mayor of Leeds said of after seeing the act perform at his son's wedding). For enquiring minds there are mp3s on RoboChrist's website, and there are several RoboChrist concert reviews out there. Earlier he's done session vocals for "Adam Pearson of the Sisters of Mercy's new hard-edged techno-rock project"
A bit of background - he does a parody character thing ROBOCHRIST which you have seen by now; it's like weird electronic industrial stuff with comedy samples, a bit of fun and well worth checking out live. In his words, it was a pisstake that he did and then suddenly people started to like it. He's definitely NOT a g*th. He's also playing with Scaramanga Six I see. Earlier he was in a great Leeds band that nearly made it called Catalyst (hence the name Chris Catalyst), played (plays?) in a Leeds punk band The Dead Pets who he toured America with. I know he was doing some singing for Adam Pearson a while ago but not sure what happened with that. A mate of mine calls him 'the Dave Grohl of Leeds'. He's a jolly nice man too, and a good guitarist. You always see him at gigs in Leeds. He [occasionally] works in Joseph's Well [as a barman]. The first rumours of RoboChrist involvement appeared in March, but the guy seemed to be in hush-hush about it for months, going as far as to delete inquiring messages to him in his website's guestbook.